Police often get the short end of the stick when it comes to public views and how society views them as a whole. One bad egg makes for a rotten dozen, right? Wrong! That isn’t the case at all. Check out these great example of how our police force is not only protecting us, but see how they are apart of us. While driving down I-164 in Indiana, Police Sergeant Jason Cullum came across a teddy bear. If you were ever taught what I was taught as a child, it’s that roads are very dangerous and not to be taken lightly. When Sergeant Cullum came across a teddy bear lying in the middle of a busy highway.This police officer stopped his vehicle in the middleof the lane, got out of his vehicle, and rescued the poor bear. More than likely, he stopped an accident from happening. More so, he probably saved the parents that were walking further up the highway looking for the bear a lot of grief from their child. He returned the bear to the rightful owner. 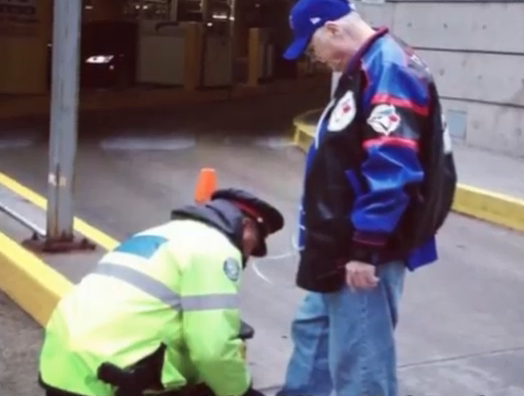 When Mark Boorsboom, a Toronto police officer, came across an elderly man with his shoes untied he didn’t think twice about helping the gentleman. We all know that with age, comes ailments.Those ailment may include but are not limited to the inability to bend over without getting dizzy which was probably the case for this elderly gentleman. That didn’t stop Officer Boorsboom from bowing downing and helping the man to tie his shoe. 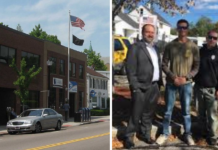 Connecticut police decided that they would put a smile on the town face by doing something special for the citizens. While getting pulled over or a DUI check point isn’t exactly what motorists want to face, it is not so bad when police decide to do something a little different. 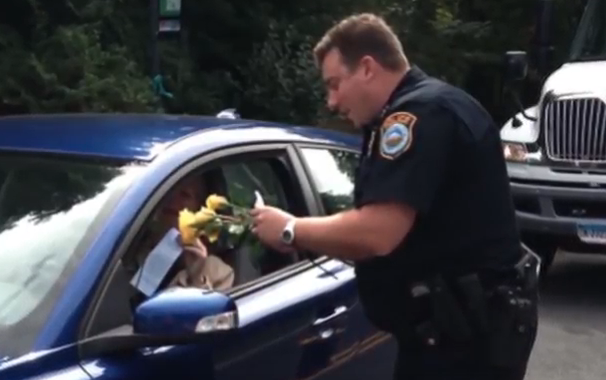 Instead of pulling people over and handing them the dreaded ticket, the Connecticut police decided to hand out yellow, long stemmed flowers to each motorist just because. They wanted to show everyone that they aren’t all bad. For kids, when asked what they want to be when they grow up, more than likely, the answer is something like, “A vet” or “A police officer”. Some kids change their mind from the time that they are young while others stick with what they want to be, knowing right from the start. 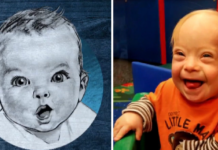 For this young disabled boy, at this very moment, he wants to be a police officer. Being disabled, it is highly unlikely that he will get the chance to become an officer, but that did not stop the Georgia police from making his dream come true. The officers of the Georgia police asked the little boy to lead their Christmas parade as an honorary member. His dreams of being a police offer came true in that moment. A mother will do anything for her children, but when Mother Nature decides that it is going to rain, rain will fall. 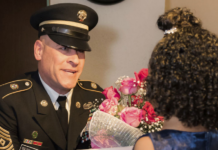 When North Carolina police officer Charles Ziegler spotted a mother and her child walking in the rain, he immediately jumped into action. Officer Ziegler didn’t offer the mom an umbrella and go about his day. He pulled over, got out of his car, and helped them into his cruiser. He gave them a ride with no questions asked so that they would not have to walk in the rain. 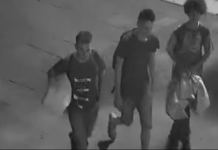 Police are often keen on theft cases, they are big on crime– Without it, they would not have a job. Unfortunately, for this little girl, Bella, her bike was stolen. 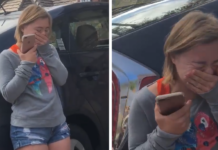 She never even got the chance to learn how to ride it.That is when Michael Kohr, a California police officer came to her rescue. Once he learned about what happened to Bella’s bike, he bought her a bike. That wasn’t all that officer Kohr did, he even taught her how to ride it. Pets don’t often understand tragedy. They understand that something has happened and they are usually supportive of their humans. But what about when that tragedy is an motor vehicle accident and the pet is injured?For this 100 pound German Shepherd, he did not understand what had happened when him and his owner were involved in a crash. Scared, the dog ran over 100 yards, fleeing the scene. Sadly the Shepherd was injured. 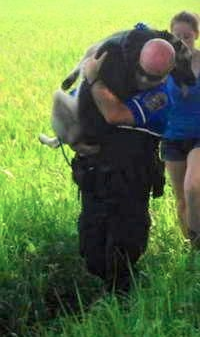 Seeing that the dog fled, Pennsylvania police officer Nick Ague stepped in to rescue the poor pup. He carried the dog to safety to receive the care that he needed, making sure that the dog was safe. The normal suburban picture that is created, that has been created throughout time, is the white picket fence, the father throwing ball to his son, and the mother weeding her flower beds. That isn’t always the case, in fact, that is hardly ever the case but in certain situations, that just how it is– Maybe dad isn’t in the picture or he works long distance. Whatever the case may be, you make do with what you have. 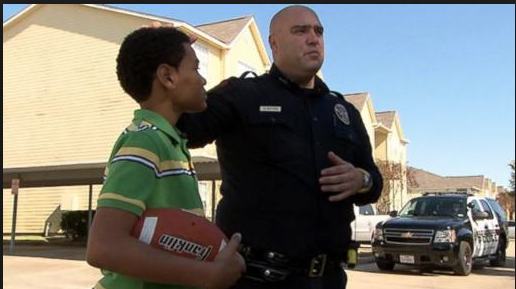 When Officer Ariel Soltura saw a young boy tossing a football by himself, he knew what he needed to do. Officer Soltura stopped to toss the football around with the young boy. He took time out his day just for a fun game of catch. Even in tragedy, this guy thought about a family that had needs. During the Boston Marathon lockdown– no one in and no one out except for authorized personnel, a family needed milk. Instead of allowing the family to suffer, Boston police officer John Bradley bought two gallons of milk to hold the family over during the lock down. There may have be other people out there that need more attention, but Officer Bradley catered to all the needs of those in the time of tragedy. Often times we see homeless people sleeping on park benches or on stoops in the city. 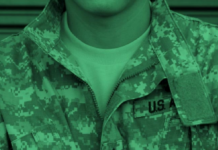 We know that they do not have a lot just from the looks of them as they are stationed without a home. While Jeremy Walsh, a Texas police officer was out patrolling he noticed a homeless man that was missing something important. The homeless man did not have shoes. Texas is a hot state and to be barefoot, without shoes, can be excruciating. 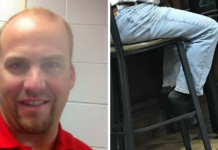 Officer Walsh stepped into action and gave the man a pair of shoes right out of his closet. Shoes, that the officer would wear, knowing that they are comfy. He supplied the man with a means to walk safely and not have issues. While out and about, this police officer noticed something strange about the animal on the side of the road. It isn’t too often that we see livestock outside of their fenced in field. This officer then noticed that the cow was injured. Not only was the cow injured and on the road, but more than likely the cow was dehydrated. The officer didn’t think twice about giving her some water. 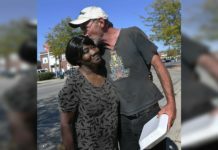 He helped until the proper people and equipment got there to rescue her. Jeremy Henwood was gunned down in his patrol car, but moments before that, his last action on this world, was an act of kindness. 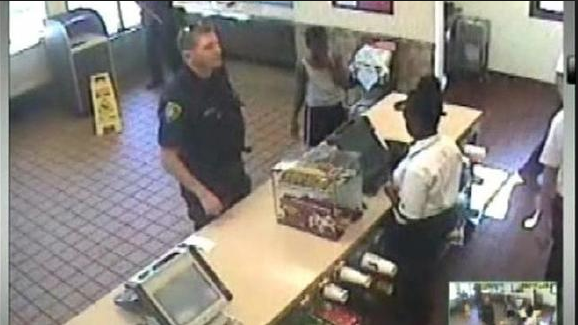 This San Diego police officer stepped foot into a McDonald– When he stepped inside, he was met with a young boy. He made that little boy’s day when he bought him a cookie. He didn’t have to buy the boy a cookie, but he wanted to make the boy smile. Officer Henwood didn’t know that, that would be the last thing he ever did. There was no way he would have known how he changed the boy’s life, but Jeremy made the boy happy as the last thing that he would ever do. 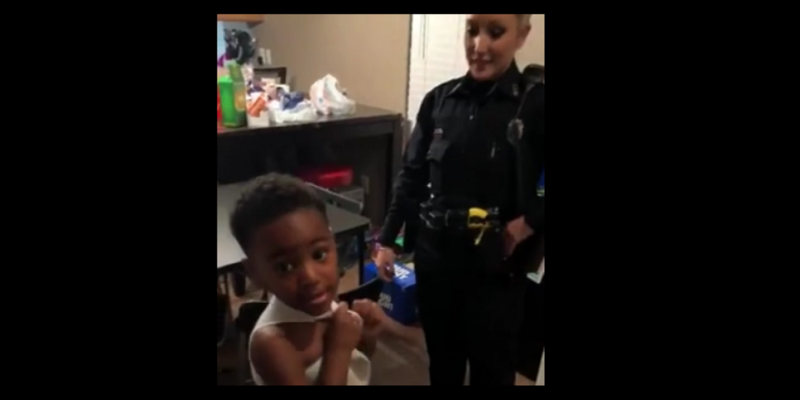 In this video a boy calls 911 to report the grinch stealing his Christmas. The officer handles it like a pro. Do you admire these police officers and all that they do for us? Be sure to like and SHARE this article with family and friends now!